Hello Sassy friends! Welcome to our challenge for this week. We've got a fun one in store for you, AND we are gearing up to celebrate 100 challenges in just two weeks.. so be sure to stay tuned to hear more about our festivities. Lots of good stuff coming up! We had a bit of a communication challenge in our last challenge, so to speak (no pun intended). We had a sketch that Dawn created to go along with the snow in our projects. 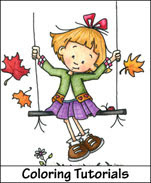 But, unfortunately, many posts did not follow the sketch and we had to ask our sassy friends to resubmit. Please check out the details of our challenge when you plan to join us. You don't have to use a Sassy Cheryl image, but we sure love when you do AND you get two chances in the random drawing when you do. Our lucky winner from our last challenge is Joann Sassy Raggedy. Congratulations, Joann.. you had two entries in our drawing since you used a Sassy Cheryl digi. 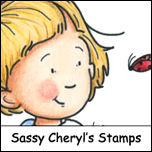 Just email Sassy Cheryl to arrange for your $5 gift certificate to her shop. 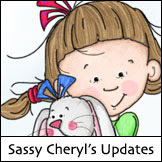 There's lots of new digis Sassy Cheryl just created.. Lulu, Polly, Noah....and more, so check them out! For this week's challenge, Sassy Dawn wants us to create something bright and cheery to chase away the winter grey. That's a lot of inspiration for a bright and cheery challenge and there's a bit of sassiness in each and every card the team created. Don't you agree? We do hope that you will join us. It's REALLY simple to do... Link up your card (or other paper project) below to your blog or online gallery, (no backlinks, please) and follow Dawn's challenge theme for this week. We'll be by to say hello and see your creation. Most importantly, have fun! You might be the lucky person who wins a $5 gift certificate to Sassy Cheryl's shop. Bright and cheery? Now that's my kind of challenge! Great choice Dawn! JoAnn. . . .congrats on the GC win. Just drop me an email and I'll get your account credited so that you can do some shopping. Congrats JoAnn on winning the challenge. Ladies, I bow to your talents. These are awesome and CHEERFUL. I'm looking out the window at some gray skies so these bits of color certainly have improved my mood. thanks Dawn for another great challenge. Thanks so much for the challenge, and for the inspiration! Thanks to everyone who played along in the Sassy Cheryl's Bright & Cheery challenge this week. 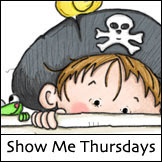 Good luck in the drawing and hope to see lots of you play along in next weeks challenge too! Congrats to the winner,all the DT members performed best.